The color blush is so on trend for the winter season. 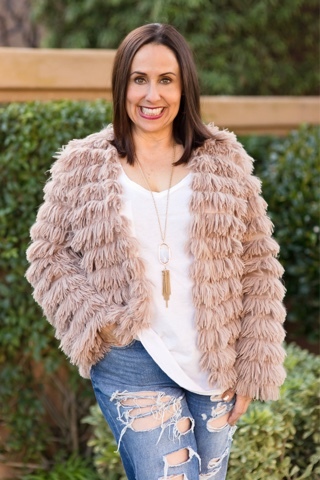 I love this fur blush jacket that I picked up at the most adorable store Jasper Plum. I love pairing pieces like this feminine and delicate quilted fur jacket with some funky distressed denim boyfriend jeans like these from Topshop. This pairing of something so sophisticated with something rugged is one of my favorite looks. I added a great white tee, my favorite Kendra Scott necklace and some perfect black booties and my outfit was complete. I hope you try this look out. I would love to hear what you think. Thanks to Gabi Wells for photos and happy reading!!!! !